Neck osteoarthritis is also known as neck arthritis, cervical osteoarthritis or cervical spondylosis. It affects the cartilages, discs and bones of the cervical area, or the neck. 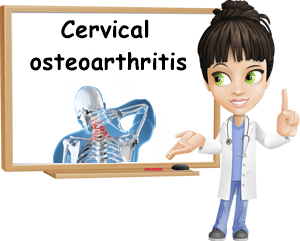 Cervical osteoarthritis is a chronic, degenerative condition that causes the cartilages in the neck to wear and tear, causing further wear to the discs and bones of the spine. This engenders pain when moving the neck, stiffness and reduces mobility and flexibility. Normally, the condition develops with age, but certain factors can hurry its progression earlier in life. There is no treatment for neck osteoarthritis because the condition is a result of the natural wear and tear of discs and cartillages of the neck area. This wear and tear can occur earlier in life for some of us, while others might reach old age and barely exhibit any symptoms. Palliative therapies such as doing exercises to relieve pain and tension, taking vitamin and mineral supplements to increase collagen production and improve joint health, avoiding bad posture, physical activities that strain the neck area can significantly improve symptoms and quality of life. 1) Age. Neck osteoarthritis is more common in people over 40 and older. The joints in our neck undergo physical changes brought on by the passing of time and continual use and slowly start to lose their ability to absorb the shock of movement, leading to neck osteoarthritis development. 2) Overuse. Intense physical effort, whether it’s hard physical labor or difficult exercise routines, can have us use up our joints faster than normal. This overuse will, in time, encourage the development of neck osteoarthritis and is not necessarily dependent on age. 3) Manual labor. People doing hard manual labor are more likely to develop neck osteoarthritis because their job has them over-straining their spine to a point that physical changes to the nature of the discs, cartilage and vertebrae occur at a much faster rate than normal. Working in a warehouse, unloading trucks of merchandise, working in construction etc. are a few examples of hard manual labor that can lead to neck osteoarthritis developing in people younger than 40. 4) Poor posture. Sitting hunched over when working at the desk or in front of the computer, keeping the neck in a tensed position when driving, for example, making repetitive moves or maintaining a neck forward posture can all create tension in the neck and put excess strain on its joints, promoting changes that could encourage neck osteoarthritis to develop. 5) Excess weight and sedentarism. Being overweight or obese generally puts a lot of stress on the body, on its joints and bone frame, causing joints to wear off faster and leading to osteoarthritis. Not exercising to maintain a certain level of mobility can increase the health impact of the excess weight and worsen joint health. It is possible for both excess weight and sedentarism to contribute to neck osteoarthritis. 6) Injury. Neck injury (from falling, lifting, accidents) can produce physical changes that cause discs to lose water and become stiff, making them unable to properly cushion the impact of movement. Certain categories of people, personal trainers, athletes, bodybuilders, gymnasts etc. are more likely to suffer neck injuries and develop cervical osteoarthritis. 7) Certain diseases. Arthritis, scoliosis, kyphosis, certain conditions that may promote the production of too much growth hormone etc. can favor neck osteoarthritis. As the condition progresses, complications such as numbness, sciatica or herniated discs may appear. 1) Pain when moving the neck. The range of movement of the neck is often limited. Sudden moves or specific ones such as bending the head forward when cooking to check on the food, looking up for too long, tilting or turning the head, stretching the neck forward to examine something or hear something better can all result in quite severe pain and stiffness. Pain is located in the back of the neck and can go upwards, causing a headache (usually in the back of the neck), but can also radiate down the shoulders. Resting in bed can help relieve the pain, but too much bed rest can cause stiffness and pain in return. It is important to maintain a balance and alternate rest with mild physical activity such as walking. 2) Stiffness. Because of the wear and tear of the joints in our neck, our vertebrae end up rubbing closer and closer together. This engender pain when moving the neck, limiting mobility and causing neck stiffness. The stiffness may be worse when waking up and improve after moving around a little. 3) Crackling. In addition to pain and a limited range of movement because of the pain, moving our neck can result in crackling or grinding noises because of the wear of the joints. 4) Tingling and shock sensation. As the condition progresses, pain can spread to the shoulder blades, arms and fingers. It’s common to experience either tingling in the arms or fingers or an electric shock kind of feeling. Such symptoms can also be a sign of nerve damage and may indicate diseases such as multiple sclerosis. 5) Tiredness, vision problems and dizziness. The pain can be so severe at times that it becomes tiresome. Dark circles under the eyes and tired eyes are thus common. Struggling to stand, walk or perform various physical activities while dealing with the pain can be tiring and when severe pain hits, double vision and dizziness may occur. 6) Loss of balance. When severe pain occurs unexpectedly, it may lead to loss of balance, difficulty standing on your feet and falling. This usually happens when there is extensive inflammation. It’s good to have something or someone to hold onto and somewhere to sit for a few moments until the intensity of the pain decreases just enough to allow you to stand up again. 2) Working at a desk. 3) Looking up or tilting the head back. 4) Resting in bed or being immobile for too long. 5) Standing for too long. 6) Engaging in physical effort. 8) Being under too much stress. As mentioned above, there is no real treatment for cervical (neck) osteoarthritis. When symptoms start to appear, it is best to see a doctor and have him or her run some tests (physical exam, imaging tests, X-rays, CT scans, MRI) and diagnose the condition. Symptoms may last up to several months and their severity may variate. Paliative care can improve symptoms considerably and render everyday life and activites pleasant again. If the condition starts interfering with daily life and no amount of care helps, your doctor might recommend surgery. 1) Avoid bad posture and moves that may trigger pain (looking down up or leaning forward). 2) Combine bed rest with mild physical activity and avoid any activity that is too strenous. 3) Keep the neck area sufficiently warm in cold weather and avoid humidity if possible. 4) Avoid lifting heavy weights . 5) Massage the neck and shoulder blade area gently for pain relief. 6) You can also benefit from the use of infrared lamp therapy. 7) Anti-inflammatory medication can help relieve pain. 8) Applying either heat (a heating pad) or ice (cold pack) to the neck can offer further relief and reduce inflammation. 9) Seeing a chiropractor can help with pain management and possibly improve mobility. 10) Physical therapy can be useful for severe pain. 11) You can wear a collar for extra neck support. 1) Exercises that seek to increase the range of motion (gently rotating the neck). 2) Exercises that aim to improve flexibility (stretching the neck). What also helps me when I’m dealing with neck osteoarthritis pain is vitamin and mineral supplementation. I take magnesium supplements that act as muscle relaxants and help me sleep better and wake up without feeling all stiff. This helps improve my mobility greatly. I have also found relief in taking Omega-3, vitamin D3 and potassium along with magnesium supplements.